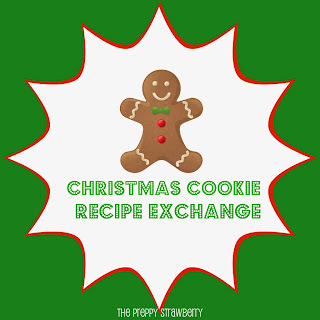 "" The Preppy Strawberry: Are you baking Christmas Cookies? Are you baking Christmas Cookies? I'm just curious how many people still do holiday baking? I'm big on holiday traditions and I can still remember my grandma baking months in advance for Christmas. I always loved opening up a tin container of Christmas cookies! So my question is anyone interested in sharing cookie recipes? I've already started my cookie baking and will be later posting my cookie #1 - but would any one be interested in doing a virtual cookie exchange? Let me know! I'm always up for new cookie recipes! i really should do some. it's hard because maddie can't eat them. my mom has a great cut-out cookie recipe, though.